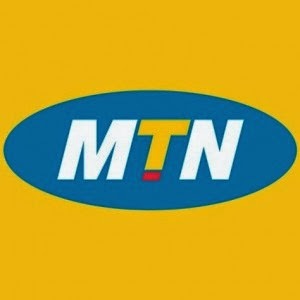 MTN new cheap data plan is the Night Plan at N25 which other network providers have been experimenting with different data rates. The competition for the smartphone internet market is really hot as different data codes have been introduced to entice more customers. 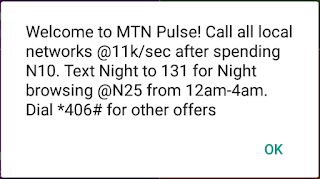 For this new Night data plan, MTN says it cost only N25 and it is valid from 12 midnight to 4 am each night. The plan is however capped at 500MB per activation. But it is just enough especially at N25 to update your apps or download a movie or the latest music release. 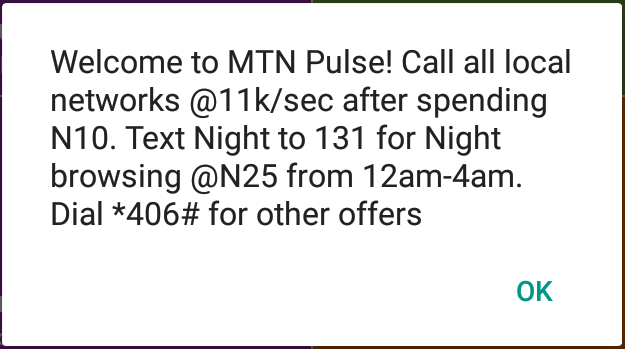 Make sure that you are on the MTN Pulse tariff plan, dial *123#" to confirm which plan you are on or dial "*406#" to migrate to MTN Pulse. You might say that the data allowance is too small at 500 mb but at N25, it can help you stay current with the released of your favorite series episode or apps update. Please share to your friends to take advantage of the offer and don’t forget to drop your comment. Wow this is owesome, I can't wait to join the league of nigh hustler lol. Mama Junior Where is my MTN Sim?